Given the high cost of having your classic resprayed, it makes financial sense to restore the existing paint on your classic. 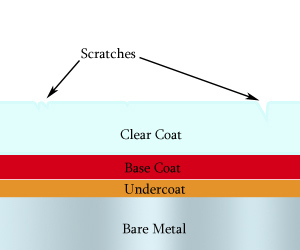 UV rays and salt can seriously fade the surface of automotive paint. Often the damage is only on the surface and can be repaired. 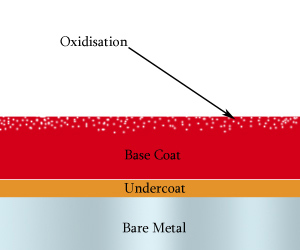 By removing the top layer of paint, the original lustre and colour of your car’s paint can be restored. I bet your wondering how you can go about resurrecting your dull and faded paintwork. First of all determine just how bad your car’s paintwork is. The more faded and oxidised the surface of the paint, the harder it will be to bring back the original colour. 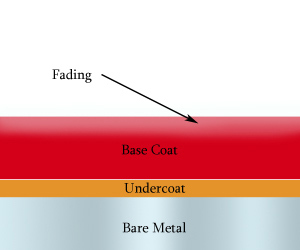 If the base coat is too thin, there may not be enough good paint left and attempts to remove the damaged/faded paint will cause you to hit primer and metal before the shine returns. If your car is in pretty good shape and the paint just seems a little faded, chances are that you will be able to have your original finish and colour back again in one weekend. First of all, you need to wash your car to remove all dirt, dust mud road tar etc from the car. Use soap/shampoo designed for use on vehicles. At the very least, use a non detergent soap. Dish detergent will remove oil from your car’s paint which is not good. There is a huge range of products out there, which one to use is mainly a personal preference. You should never use liquid or powdered laundry detergent (it has been known). These soaps will actually harm your paint. Be sure to use a clean sponge or hand applicator to apply the soapy solution on your car. Any dirt on the sponge or hand applicator car will scratch your finish making more work for yourself later on. Before washing your car, spray down the wheel wells and under body to remove any oily grime that may splash back up on your clean car. If you find any rust spots or dings, consider treating them first before you start to restore the old paint work. You should always wash your car in the shade to avoid water spots if it dries too fast. Spray down the roof first, then the bonnet, then move to the sides and then the front grill followed by the rear panel. Then using a big sponge and a bucket of soapy water, wash your car in sections, beginning with the roof. Always rinse one section before you go to the next, this is so the soap won’t dry on leaving marks. Once your car is washed, use a chamois to dry off the car. As you wipe water from the surface, wring out the chamois this will help prevent streaking. Once the car is dry, check for any spots you’ve missed, tar, insects and any other dirt. Remove stubborn dirt with a good road-tar remover. Now that your car has been cleaned, you can get a better idea of the condition of your paintwork. Look for fading, and oxidisation of paintwork as well as acid etching (from bird droppings) and scratches on the paint. The next step is dependant on the kind of paint that has been applied to your car. If it is metallic paint with no clear coat, avoid any kind of abrasive polishes. An example of a decent nonabrasive polish is Turtle Wax Metallic. Most other manufactures of waxes also sell polish that is suitable for metallic finishes. Most classic cars don’t have a clear coat, unless they have been repainted. If your paint is severely faded or heavily scratched, you will probably need a rubbing compound. This is a big job and best done by hand (although It is possible to use a buffing machine). There is a risk of badly damaging your paintwork if done over enthusiastically or on thin paintwork. However if the only alternative is repainting, you might want to give it a try. Polish and a polishing compound may not be the same thing. Some polishes contain abrasives and others do not. Some polishes will say they are fine for all paint, or new paint or faded paint. Some come as a liquid, some are wax some are waterless. 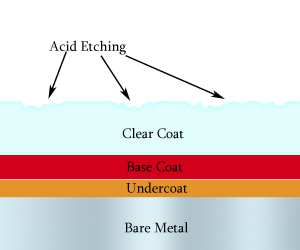 Rubbing compounds come in liquid or paste. Liquid is easier to apply, but you do not get as much compound for the money. It is always advisable to stop and read the label to see what your getting and decide if it is right for your car. Whether you’re using an abrasive hand-applied polishing compound on severely faded paint, or a nonabrasive polish on clear coat. You should always work in the shade or in a garage. Apply the polish to a small area and use a supplied applicator or a piece of soft lint free cloth. Follow the package directions. Some use water, some don’t. If you are using an abrasive compound, you will see removed paint on your applicator. To do a hand compounding job right, a lot of elbow grease is needed. Do a 2 foot square area at a time. If the damage to the paint is severe, begin by lightly wet sanding the area with 800 grit sandpaper (I know it sounds scary but it works). This is not recommended for clear coat or metallic paint. Once sanded, apply the compound to a soft cloth or the supplied applicator. Apply the compound with straightback and forth strokes. Remove the compound and then inspect the paint. If the surface isn’t glossy once the compound is washed off, you haven’t removed enough paint and should try again, but be careful not to rub all the way through the paint. Read the instructions that come with your machine or have someone show you how it is used. After you have compounded all the painted surfaces, remove the masking tape and do problem areas by hand and areas where the machine could not reach. Now that your car is compounded or polished, rinse it thoroughly with warm water and dry it with a chamois. Once the car is 100 percent dry, apply some pure carnauba wax. This will make your car shine like new again. The wax will also provide a good layer of protection. Make sure the wax does not contain any abrasives as some brands do. Apply the wax to one small area at a time and polish it with a soft lint free cloth. Now shine up your chrome using a stainless steel or chrome cleaner and you’re ready to go cruising in your glinting classic car.